Will you be Stronger with Decabolin (19-Nor Andro) by Hi-Tech ? Get ready to know more about the Legendary Nandrolone equal substitution. Our strong anabolic stacking prohormone is as efficient as Nandrolone lowering estrogen rates and increasing your muscle size and strength! 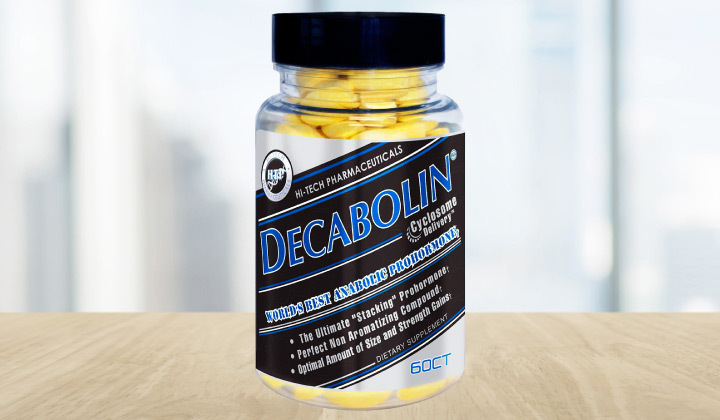 Introducing a prohormone to be used in a complex or just separately – Hi-Tech Pharmaceuticals Decabolin! Why is Decabolin so Powerful? Where to buy Decabolin ? When used separately, it is a potent prohormone as well, which allows athletes to gain lean muscle mass. Most sportsmen observe more striated muscles and a firmer, leaner look after they started using Decabolin. Therefore, most bodybuilders take it while they are trying to cut fat. However, you can use it during bulking exercises as well! Decabolin is also perfectly suitable to be used for strength increase when athletes decide to get on with a mass bulking cycle. The product is really good when you take it in any complex you are on at present! At present, Decabolin is the only legal “Nandrolone” counterpart available on the market. Taking Decabolin (19-Nor Andro), you have to comprehend it converts to Nandrolone almost instantly. In addition, Nandrolone is far better than even testosterone if you look forward to building lean mass and increasing muscle strength… and what is prominent… the prohormone does it, avoiding unwanted side effects. Nandrolone is also known as “Deca” and in fact, it is a perfect probolic compound. The more difficult name for it is 19-NorAndrost-4-ene-3b-ol, 17-one Decanoate. Actually, this is the only legal compound of its kind which turns into “Deca” in the human body. As earlier said, Decabolin produces much fewer side effects. It is unable to convert to estrogen, so, you will experience no issues with gynecomastia or bloating. Moreover, it does not convert to DHT, consequently, the hair loss issues will not bother you any longer. Hi Tech Pharmaceuticals utilizes Cyclosome Technology to deliver the compound safely and unchanged. This tech resorts to a liposomal delivery method to ensure Decabolin’s maximum bioavailability. You have to know that our competitors’ products with different compound delivery methods are actually almost completely destroyed during the digestion process. With the Hi Tech Pharmaceuticals product, there is no need to worry about it. Your body receives almost 100% Decabolin bioavailability when taking it using the Liposome Technology. This method ensures that more of the compound gets into your bloodstream unchanged. Having more of the active compounds present in your body, you will achieve better bodybuilding results. Hi Tech Pharmaceuticals recommendations are as follows: take 1 tab in the morning and 1 tab in the evening. In case you use this product in combination with some other, you have to follow this advice: do not take more than 2 tabs a day; take the compound for 4 to 8 weeks, and then, take a break for at least 4 to 8 weeks.